Color: Powder Coated - Chrome Plated / Metal Polished. - Rocking & Rolling motion & Pulse mode feature with momentary pause ensures efficient mixing of blood samples, viscous substances and liquid-solid suspensions. - Lab Mixer is a Jacketed Container of 10 Liters Vessel Capacity. - Vessel Inner and Outer Surface, lid, valve plunger are made of SS 304 and Mirror Polished. - The lab mixing tool is driven by high torque AC motor controlled by AC variable frequency drive. The tool speed can be varied from 50 RPM to 1500 RPM. 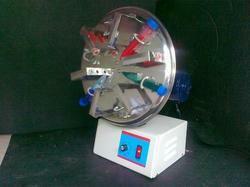 We are the Leading manufacturer of Laboratory Mixer. Being a leader in the industry, we are engaged in manufacturing and supplying a qualitative range of Vortex Mixer. Due to its excellent performance and smooth operations, the offered mixer is profusely demanded amongst our esteemed clients. Beside, our reputed clients can avail this mixer at nominal prices.